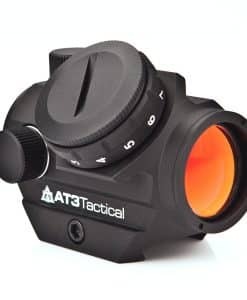 There are situations when the shooters require to achieve a target quickly with a max field of view. It is in situations like these that a red dot that lets you target and view with both eyes open can come in handy. 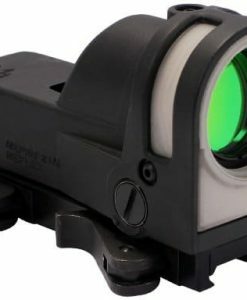 The Vortex Optics Strike Fire 2 Red/Green Dot Sight is a multipurpose and reliable red dot. Comes with multiple useful features and a strong body, without being heavy on the pocket. The streamlined on/off controls house on the rear end, with as many as 10 varied dot intensities. Two of the intensities being suitable for night vision as well. The 30mm body is made of aluminum alloy,It has extra strength and superb recoil rate and designed to resist both water and fog for extra safety. 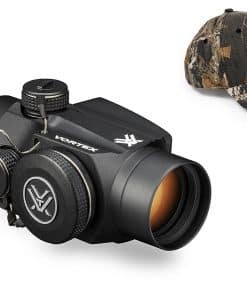 A 1 X magnified, 30mm sturdy aluminum alloy body with multi-coated optics ensuring greater brightness, lesser reflection and infinite eye relief. Rough and resilient structure which can easily bear recoil as well as without, while still being light and compact. 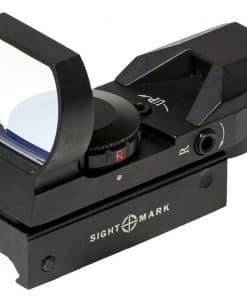 The sight has the options of a red or green dot with 4 MOA reticles, a shot correction of ½ MOA and elevation adjustments equating 100 MOA. The choice of color offers great eye relief to the shooter. 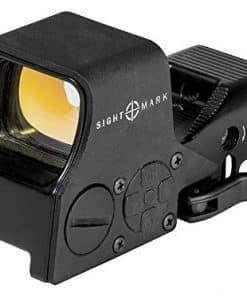 Designed to avoid the parallax error, the Vortex Optics Strike Fire 2 Red/Green Dot Sight has 10 varied brightness levels with two of them being compatible for night vision. Safety has been incorporated into the design element, making the aluminum structure shockproof, filled with nitrogen, waterproof and fog proof. 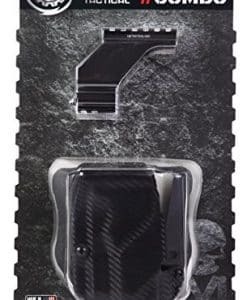 Flip up covers for the front and back lens and anodized finish for the sight. O-ring seals protect against moisture and dirt. Maximum battery life extends to 6000 hours with min brightness and reduces to 300 hours with max brightness, an automatic shutdown after 12 hours tends to enhance the battery life. 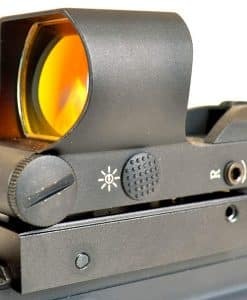 The cantilever ring mount helps situate optic center 40mm higher over the base, letting the shooter have a 1/3 co-witness thanks to the iron sights, when mounted over AR-15 rifles. A rugged and strong structure that can take the beating in a chase on rough terrains. The design has safety elements incorporated to give you the best shooting experience ever. 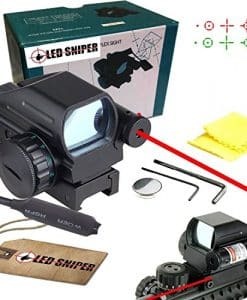 The Vortex Optics Strike Fire 2 Red/Green Dot Sight relieves stress and lets you target easily with a range of brightness levels to choose from. Great worth for your money. 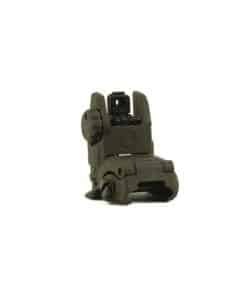 Question: Does the model have a tall mount well-suited for the AR or shorter mount meant for rifles? Answer: Yes, it is a tall mount and matches perfectly with a flat AR. A bit too tall for standard rifle though. It has a lower 1/3 co-witness with cantilever mount. Mounted it over an AR and found it lets the front sight to be seen in the lower 1/3rd window, the red dot appearing above the front sight. 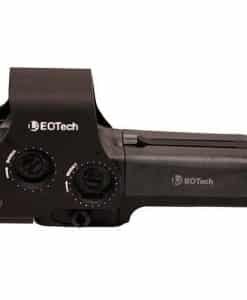 To get the red dot in the center of the front sight you need an additional true co-witness mount, available from the same manufacturer. Question: Can I get the details on the MOA for the product? 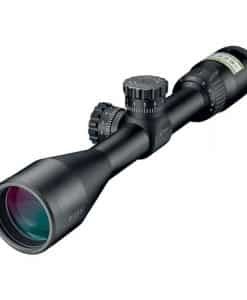 Answer: Vortex Optics Strike Fire 2 Sight has 4 MOA reticles. Not suited for the precision shooting, serves great on carbine though. Question: How is the 501 any different from 505? Does it have a Cantilever Mount? Answer: 501 comes with a Cantilever Mount, while the 505 does not. Question: Does the mount fit over an AK? 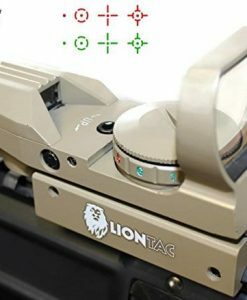 Answer: Vortex Optics Strike Fire 2 Sight is likely to fit well over an AK, provided you can use the rail mount for the purpose. Literally it’s the best red dots I have ever been introduced to. Even after one thousand rounds passing through my AR, somehow it still manages to maintain the zero. The option for brightening or lessening makes it even better. Spending money on some other optic is a total waste of money. Vortex Strike fire 2 is all you need. Been through three combat tours and served for seventeen years in the military and still find it over and above any other sight. You get a more worthy product than what you paid for. I did order Vortex Strike fire 2 because of the updated version, cantilever mount did not suite my purpose though. Despite that, I get the mount and the only difference is that I got the color of my choice. But, the product works amazing and the delivery was real quick so there isn’t much I can complain for. Blunders occur, hopefully I’ll be able to work it out. Too happy to pay for the budget red/green dot. Vortex stands for quality products with economy. I get a clear glass, unlike the tinted ones normally found. I have the option to have a red or green dot, easy to handle controls and that’s it. Although the red/green dot blooms when set for higher settings, but it remains completely fine otherwise. 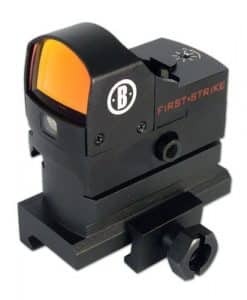 No doubt Vortex Strike fire 2 sight is an amazing optic. And the great price you get it for is not the only reason I like it so much. 200 rounds old, mounted over my AR, it still holds its zero so well. 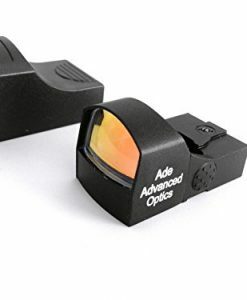 And the AR does not spare cheaper optics, so this one’s good. Ghosting is easy with this product and I love it that gets really dim, so helpful in attaining accuracy. I literally was able to target the metal turkeys hoisted at 200 yards without any problem. I just live the fact that it comes with a lifetime guarantee.